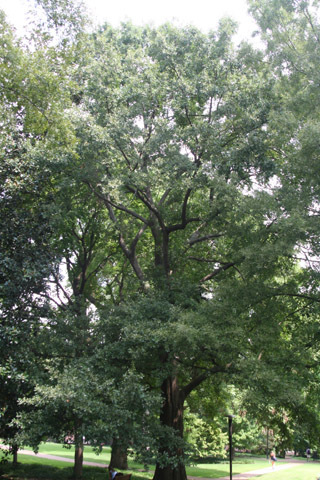 Although water oaks are native to the southeastern U.S., they aren't typically found in the wild in the Nashville area. They are adapted to swampy habitats, but they also do well when planted as ornamentals and there are a number of them around the arboretum. This one north of old Benson Science Hall and across the path from the Margaret Branscomb statue was planted long ago, and has had enough time to grow to be the largest of its species on campus. It has a diameter of 120 cm (47 in. ), is 21 meters tall (67 ft.), and has a crown spread of 22 meters (71 ft.). The leaves of water oak range in shape from oblong to paddle-shaped. The presence of bristles at the tip of the leaf or at the end of small lobes is a clue that this tree falls in the red oak group, even though lobes are often absent altogether. This organism is a living specimen that is part of the  Vanderbilt University Arboretum  with the local identifier 2-209.